Welcome to the Omicron Research Institute home page. Omicron Research Institute is devoted to the study of the relation between Econometrics and Technical Analysis of the financial markets, using established techniques of Digital Signal Processing and Time Series Analysis. The techniques we use are derived from both Technical Analysis and the Random Walk model. These techniques are incorporated in our QuanTek trading and investing software for Windows, designed for the individual or institutional investor or trader. We use QuanTek to maintain our Model Portfolio on this website with various studies of technical analysis and market behavior updated every week. Also on this website is a collection of Articles and Demonstrations about various aspects of the QuanTek program related to Econometrics and Technical Analysis in general. QuanTek is a new type of trading and investing software that is based on the latest ideas from Econometrics and Time Series Analysis, in relation to Technical Analysis of financial markets. In particular, QuanTek makes extensive use of our proprietary Adaptive (Wavelet) Linear Prediction Filter to make a Price Projection based on long-term correlation in the past price data. From the expected return and risk (volatility) of each security in the portfolio an Optimal Portfolio is calculated and displayed. There is also a Portfolio Report which displays the expected future returns, actual past returns, and risk on various time scales for the securities in the portfolio, along with the results of the Optimal Portfolio calculation. To see QuanTek in action, please see the Model Portfolio page. 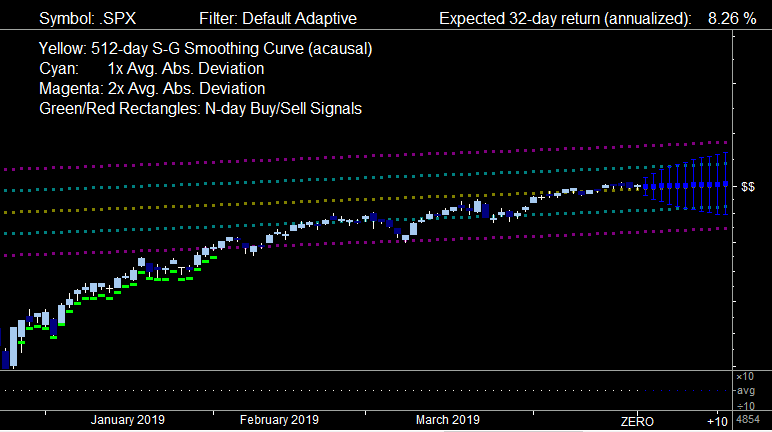 This graph shows the Price Projection and the Expected 32-day return derived from it. QuanTek can give you a more realistic view of the long-term trends and short-term fluctuations of the market, enabling you to make more profitable trades. The Bollinger Bands and other features of the Main Graph are very useful for identifying oversold and overbought conditions, helping to identify optimal buy/sell points. The Price Projection is also very useful for separating the long-term trends from the short-term fluctuations in order to see clearly the true state of the market. For a more detailed explanation of the features of QuanTek, please see the QuanTek Features page. QuanTek uses sound principles of Econometrics to extend both Technical Analysis and the Random Walk Model. For each security, after correcting the logarithmic prices for splits & dividends, a long-term 2048-day trend line is computed. The average daily price range is also computed. The Price Projection is then computed based on these quantities, utilizing our proprietary Adaptive (Wavelet) Least Mean Square (LMS) Filter. One interpretation of the Random Walk Model is that the Price Projection is given by the extension of the long-term trend line to the future, so the expected future return is the slope of this line. The expected range of prices for future day N is given as the average daily price range multiplied by the square root of N. The Random Walk Model postulates that no function of past prices can be a predictor of future returns. On the other hand, Technical Analysis postulates that there exist technical indicators, which are functions of past prices that have predictive power for future returns. QuanTek uses an Adaptive (Wavelet) Least Mean Square (LMS) Filter to try to determine the best (time-varying) predictors of future returns and arrive at a Price Projection which depends on these predictors. It thus builds on the basic principles of the Random Walk Model but goes beyond this model. It also extends the basic principles of Technical Analysis by interpreting the predictors as technical indicators. The effectiveness of this approach is verified by extensive Statistical Tests. QuanTek has many unique statistical tests that are used to test the Adaptive filters, and also for general Econometric information. In particular, the program contains correlation tests which are used to test the effectiveness of the Price Projection from the Adaptive (Wavelet) Least Mean Square (LMS) Filter. However, these tests are separate from the rest of the program and are not needed for ordinary trading and investing. QuanTek can be used with portfolios of stocks, ETFs, mutual funds, or indexes data. The program keeps track of both an Optimal Portfolio and a Model Portfolio of securities in the same portfolio. You can create any number of portfolios, simply by creating new data files in a new folder. QuanTek uses your choice of two data sources -- AlphaVantage (free) or EOD Historical Data (inexpensive). You can download Historical, Daily, or Intra-day data from either of these sources with a single click of a button. The data are parsed and stored in the data files for each portfolio automatically. You can also parse CSV files in a variety of formats, and also export CSV files. For more information on available data sources, see the Database Data page on the Download QuanTek page. In the Portfolio Report you can view both the Model Portfolio and the Optimal Portfolio. The Optimal Portfolio, which consists of all the securities we are tracking at the moment, is optimized based on the expected return from the 2048-day Long-Term Trend, along with the risk based on the measured average absolute deviation of the prices. We also take into account the Price Projection in our Buy/Sell decisions, as well as other general features of the graphs including Technical Analysis, and our general knowledge of the markets and current events. This page containes a detailed description of the features of QuanTek, including studies of the graphs (Scales 1,2,4,8,16), and the Price Projection. This is followed by an exlanation of the three Indicator (Splitter) Windows, which show additional important indicators related to the Price Projection. From these are derived the Buy/Sell Signals, Buy/Sell Points, and also the Long/Short Signals. This is followed by an explanation of the Optimal Portfolio, along with the two main methods of viewing it which are the Portfolio Report and Short-Term Trades dialog. Following this are explanations of the four types of Statistical Tests, which are the Correlaton--LP Filters/Indicators, Scatter Graph Indicators/Returns, Wavelet Analysis/Variance, and finally the Periodogram/Wavelet Spectrum. Also there is a History of the QuanTek program. You can download and try out the program without a license using the Sample Files provided. You can then purchase a one-year license, which is valid for all updates during the subscription period, using the PayPal button on this page. Some of the articles listed also appear in the QuanTek Help file, which you can view by downloading QuanTek. You can also find more detailed information about QuanTek in the Help file. We have started a new set of correlation tests of the new QuanTek version 3.9 Price Projections and posted these here. Please view the latest correlation test (2018-12-07) of the Default Adaptive Filter on the Correlation Tests page. These demonstrations are a set of detailed tests of the performance of the QuanTek program. They also explain in detail how the QuanTek program works and how to use it effectively. We would also like to hear any and all feedback regarding how you like the QuanTek program, suggestions for improvements, complaints, or if you find any bugs in the program. As always, "Past performance is no guarantee of future results."